Venezuela is on a path towards environmental devastation. In 2016, President Nicolás Maduro opened a large swath of Venezuela to national and foreign mining companies. He was following in the footsteps of his predecessor Hugo Chávez, who first announced plans for the Orinoco Mining Belt, or the Arco Minero del Orinoco. Chávez was the “father” of the idea, but Maduro implemented it to offset the decline of oil revenue at the national petroleum corporation PDVSA due to alleged corruption and mismanagement. The vast area, some 112,000 square kilometres, covers 12 per cent of the Venezuelan territory. It crosses rich tropical forests, including the Sierra de Imataca in the east and the centrally located El Caura, as well as the Orinoco and Caroní river basins. These are all fragile ecosystems, containing the sources of water and plant life that provide the mechanisms that regulate the environment and the generation of hydro-energy. They could be seriously affected by such an extensive mining project that includes legally protected environmental preserves and Indigenous communities. In the two years since the first mine broke ground, 200 hectares of forest were lost between December 2016 and April 2017. 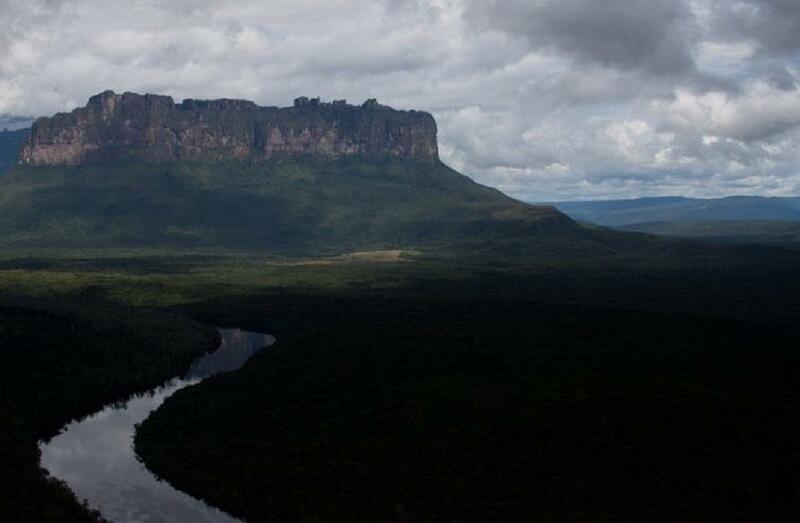 Deforestation and pollution from the use of mercury have spread to Canaima National Park, even though it’s a protected area by Venezuelan law. Both international corporations and the Venezuelan military — responsible by law to protect the area — are to blame for this environmental devastation, according to experts in the area. So why aren’t any of the global environmental organizations speaking out about it? As a Canadian-Venezuelan journalist and scholar, I’ve been trying to answer this paradoxical riddle. The Orinoco Mining Belt has large reserves of coltan (a mineral coveted by the electronics industry), bauxite, diamonds and gold. Roberto Mirabal, who leads the mining ministry, puts their value at about US$2 trillion. Under a scheme of strategic partnerships, the Venezuelan government gave mining concessions to a number of companies based in China, Russia, Canada, South Africa, the Republic of Congo and Australia in 2016. But foreign companies were pushed out and replaced by unregulated miners, backed by the military in 2017. In 2016, to give legitimacy to the exploitation of mineral resources by the National Bolivarian Armed Forces (FANB), Maduro created CAMIMPEG, Venezuela’s military-run oil and mining company. The FANB has allegedly been involved in diamond and gold smuggling, swindling artisanal miners and working with guerrilla groups, including Colombia’s National Liberation Army and gangs, well before the creation of CAMIMPEG. Within Venezuela, people are speaking out against the mining activity. Chávez’s former ministers and officers have tried to stop the mining there, but their actions were dismissed by Venezuela’s highest court. And several Venezuelan non-governmental organizations have also warned against the mining belt’s harmful impacts, to no avail. But little has been said about Venezuela’s mining activity at the international level. Top environmental groups, including Greenpeace and the World Wildlife Fund (WWF), have been silent. As of June 2018, there was no mention of Venezuela on the Greenpeace international website, “Orinoco mining” on the WWF website (apart from an article about sustainable fishing in Colombia) or the Arco Minero. Other organizations such as MiningWatch Canada have not released a public statement about the participation of Gold Reserve — a gold mining company headquartered in Washington state — in the Arco, beyond a recent timid tweet after being pressed to say something about the partnership between the Canadian mining corporation and the Venezuelan regime. These global green activists are usually noisy — what might be behind their surprising silence? First, despite having highly polluting industries such as oil and mining, Venezuela has been off the radar of the big environmental NGOs because it was once considered a middle-income country. A perceptual bias could be guiding the advocacy activities of such organizations, who have been very vocal in some cases (e.g. Chevron in Ecuador). Second, Chávez’s “leftist revolution,” which favoured the poor, has granted Venezuela a benevolent image (now widely denied), exonerating it from suspicions of ecocide. The same could be said of some green progressives who have chosen ideological blindness instead of facing the truth about the ecological crime that is being committed in Venezuela.